Just in time for its 10th anniversary, Tamina Therme at the Grand Resort Bad Ragaz in Switzerland is opening The Ragaz Sauna Village, which expands the thermal bath's spa area by 1,000 square metres and houses one of Switzerland's biggest infusion saunas. 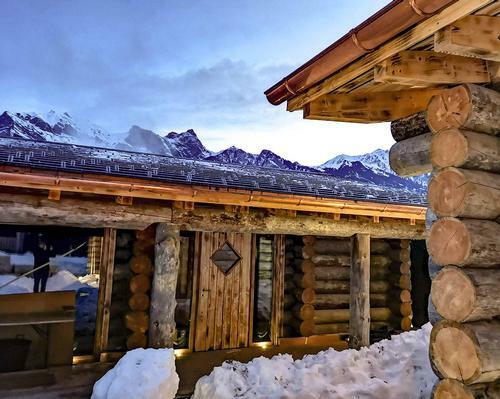 Around three million Swiss Francs have been invested in the expansion, which took around six months and includes three sauna houses and a pond. The sauna’s offering has been narrowed down to two key factors: tranquillity/health and entertainment/experience. Two of the buildings are built entirely of Scandinavian Kelo wood. The dead polar pine has dried out under natural conditions and is ideal for building saunas due to its robust and insulating qualities. The wood’s intense aroma also fills the interior of the saunas. The Ragaz thermal water has always been at the heart of the experience, and a mineral infusion ritual has been created, which will now be conducted four times every day in the bathing area. A special salt made of magnesium, calcium and lithium was developed for this ritual, and when it comes in contact with water, it gives off its energy and warms up literally in the guests’ hands. “We have this unique water which represents the life elixir of our thermal baths and we want to bring our guests nearer to the energy of this element every day,” said Grünenfelder. The sauna’s offering is complimented by the Sauna Lounge Hermitage, which is in one of the oldest buildings within the whole of Grand Resort Bad Ragaz. Inside, guests are pampered with food and drink created specifically for the body’s needs before, during or after taking a sauna. During the opening weekend from 1st to 3rd February 2019, the resort has created a programme of events with high-profile guests from the world of saunas. Guests can experience an infusion ceremony with the 2017 world champion, Jiri from Poland. There will also be a relaxing singing bowl ritual with Frits and Yvonne from the Netherlands as well as a Latvian pirts sauna ritual. Ole, Olaf and Christian from Germany will be also gracing the sauna stage several times during opening week as Blue Man Group. The Ragaz thermal water bubbles up from the source at a temperature of 36.5° C after trickling through the Alps for some fourteen years. The source with the most water in Europe was discovered 800 years ago and is noted for its healing properties. Tamina Therme is embedded in Grand Resort Bad Ragaz, a leading wellbeing & medical health resort, and designed to be a wellness oasis for the relaxation and regeneration of mind, body and soul.